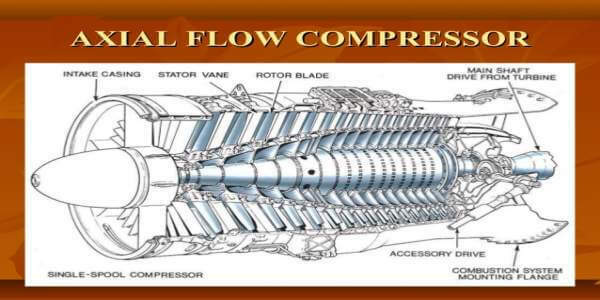 At a Gas Turbine Power Plant, different types of compressors are used. The selection of an air compressor in gas turbine power plant mostly depends on the requirement of compressed air to run the turbine engine. The gas turbine is used in power plant to drive the generator. With this, you can produce electricity with other arrangements. Today electricity is the prime requirement to run the engineering plant and also our day to day life. To fulfil this need, power plant generates electricity in combination with other types of machinery. Usually, a rotary air compressor is used with a gas turbine. Mostly centrifugal compressor or axial compressor is used. So, I will like to share some information on construction and working on both compressors. The impeller, which consists of a large number of blades, is mounted on the compressor shaft, inside the stationary casing. As the impeller rotates, the pressure in the suction region falls and hence the air enters through the eye. Air afterwards flows radially outwards through impeller blades. As a resulting velocity and pressure of air increases. Later this air enters and flows through the convergent passages formed by the diffuser blades. At this stage, the velocity of air is decreased but the pressure increases still further. You may say that during this stage the velocity energy is converted into pressure energy. Finally, this high-pressure air escapes from the compressor delivery portion. This is single stage compression, hence suitable for small pressure ratios. You can also obtain high-pressure ratios by arranging the number of an air compressor in series. These types of compressors are more commonly used nowadays. 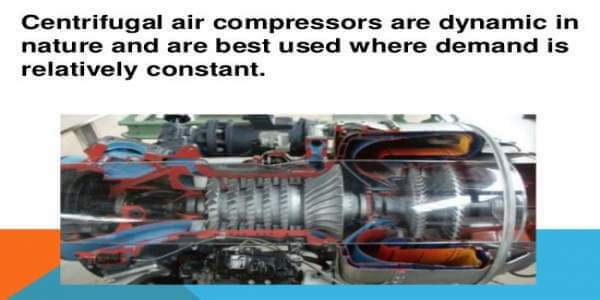 In an axial compressor, the air flows in an axial direction right from intake to the discharge. The stator, which has stator blades, encloses the rotor, which is provided with rotor blades. As an air enters the suction region, it flows through the alternately arranged stator and rotor blade rings. In flowing through each pair of blade rings formed up of one rotor blade ring and one stator blade ring, the air gets compressed successively. The air is finally delivered from a delivery region, which is smaller in size compared to the suction side.